Soon I am going to be starting my Snowy Evening Knit-a-long. We will be knitting an oblong scarf based on the stitches in a triangular shawl that I designed several years ago. I have varied the stitches a little but essentially you will be capturing a snowy evening like this in lace. You will need about 630yds of lace weight yarn. I will be using Fantastic Knitting Zephyr Lace weight in Ice Blue. The scarf begins with a provisional cast-on. I will post a video of this cast-on; but you may want to practice it first. It isn't difficult nor are the other stitches that you will be using. I hope to begin Feb 13 by posting the first chart and then a chart a week after that for 3 weeks. 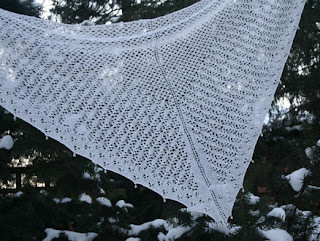 The pattern will be FREE on the Queen Anne's Lace Knitting website after the KAL until the end of March. Think of this as a nice way to spend some time in February as we wait for Spring!! I will also be posting on Facebook and on Ravelry. Feel free to post your progress, or ask questions. This KAL is open to everyone regardless of your level of experience in knitting. I'd love you to join!! !